Origin and Habitat: Garden origin. The natural species is native to Southern Brazil, Uruguay, and province of Entre Rios, Argentina where it grows in grassy plains or in low hills in lowland up to to 1000 metres above sea levels. The climate is tropical, continental. Winter are completely dry, while in summer the landscape is flooded by torrential rain and soaked with water. Rainfall up to 1500 mm per annum. Average annual temperature 25-30 ° C. Rarely the temperature drop below zero degrees even if the landscape is open to the cold south pamperos winds. Description: Echinopsis eyriesii is a very popular large caespitose cactus, widely grown for the huge nocturnal flowers. 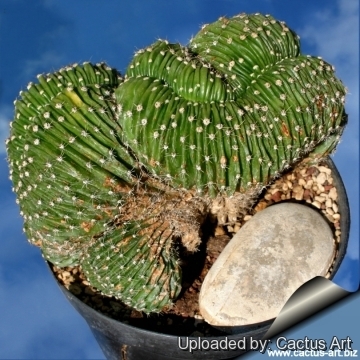 It is the best known and most commonly grown globular cactus. 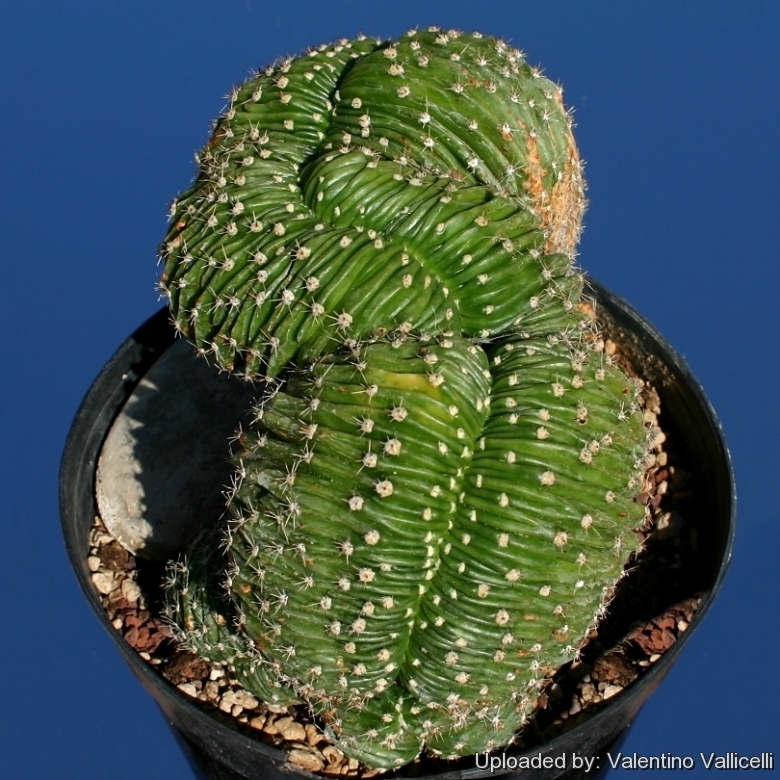 Crested form: The crested form (Echinopsis eyriesii var. cristata) is a fast-growing and robust crested cactus forming brain shaped mounds. Exceptionally in time it may forms large mounds up to 1 m tall and 2 m wide. Stem: Fan shaped, 15-30 cm high, 12 to 15 cm thick, dark green and ribbed. Ribs: 9 to 18, not tuberculate, prominent, rather thin above. Areoles: Circular, filled with white or tawny wool up to 1 cm apart. Spines: Several, 14 to 18, very short. Radial spines: Thin 5-10 mm long often missing in adult specimens. Central spines: 4-8 thick, conical, less than 5 mm tall, hard, blackish. Young plants and offshoot initially have longer and weaker spines, the stout short conical spines appear only later. Flower: Nocturnal, pure white, very large, from the side of plant but above the middle, 17 to 25 cm long, 5-10 cm in diameter (The presence of pink shades in the flower shows hybridization). Floral tube funnel-shaped with a strong basal part underlying the ovary, then narrow and variously curved and gradually extending into the crown, dark green covered with small, ovate, brownish scales and dark grey to black hair. Lower outer perianth segments, rather linear and greenish, inner perianth-segments broad and white, acuminate. Throat greenish, with several several stamens around the inner perimeter. Stamens and style shorter than the perianth-segments. Flowers are intensely fragrant. Blooming season: Flowers appears from spring to summer in several flush at night. In sunny weather the next day they fade, but in cold, rainy weather they may last two, rarely three days. Fruit: Up to 5 cm long, green, covered with hairs and containing a large number of black seeds. Remarks: Echinopsis eyriesii is strictly related and forms a complex with Echinopsis oxygona, Echinopsis multiflora and Echinopsis multiplex (and their hybrids). All this species have the same elongated stem with sharp ribs and long funnel shaped flowers, but distinguish for the longer spines and the pink flowers usually unscented. Sometime Echinopsis eyriesii is confused with Echinopsis subdenudata that has round (not elongated) stems with very large woolly areoles. Echinopsis eyriesii (Turpin) Pfeiff. & Otto: has elongated stem with sharp ribs and long funnel shaped white-flowers. Spines 14 to 18, very short. Distribution: Southern Brazil, Uruguay, and province of Entre Rios, Argentina. Echinopsis eyriesii f. aurata hort. : schizochromic form. It has pale yellow stems due to the absence (or reduced production) of chlorophyll pigments. Echinopsis eyriesii var. cristata Donn.Sm. : crested form. 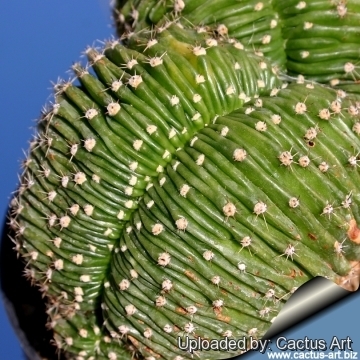 It is a fast-growing and robust crested cactus forming brain shaped mounds. Exceptionally in time it may forms large mounds up to 1 m tall and 2 m wide. Cultivation and Propagation: Crested growth: Unlike 'monstrous' varieties of plants, where the variation from normal growth is due to genetic mutation, crested growth can occur on normal plants. Sometimes it's due to variances in light intensity, or damage, but generally the causes are unknown. A crested plant may have some areas growing normally, and a cresting plant that looks like a brain, may revert to normal growth for no apparent reason. If you have any of the crested part left you need to remove the normal growth and leave the crested part behind this will need to be done regularly.